The word ‘synagogue’ is derived from the Greek for ‘gathering’ or ‘meeting’. It is a place where believers come together for a common purpose. The synagogue complex can be the venue for a range of activities and religious events such as bar mitzvahs, circumcisions, weddings, and meetings for justice groups. The synagogue also plays an important role in the education of Jewish adults and children. A synagogue will often house a library and classrooms where religious education lessons are held. The primary purpose of the synagogue is though to provide a space for public and communal prayer. Judaism is a “congregational religion that expects its adherents to express their faith not only as individuals but also as members of a community” (Gwynne, 2009, p327). Certain prayers are said at specified times in the synagogue and for some official prayers there must be a minyan which is the presence of 10 adult men. Most synagogues have prayer services three times a day – in the morning, afternoon and evening. Synagogues vary considerably depending on the culture and period in which they were constructed. The three forms of Judaism; Reform, Orthodox and Conservative, also have variations to the synagogue space. The unique elements of a synagogue though are found inside rather than outside the building. Explore this virtual tour of a traditional Jewish synagogue. ​Compare what can be seen in the traditional synagogue with this video from Interfaith Explorers which shows a modern Jewish synagogue, including important elements such as the aron ha kodesh and bimah. Click on the picture to go to a handout on visiting the synagogue from the Commission for Ecumenism and Inter-religious relations (Roman Catholic Archdiocese of Brisbane). 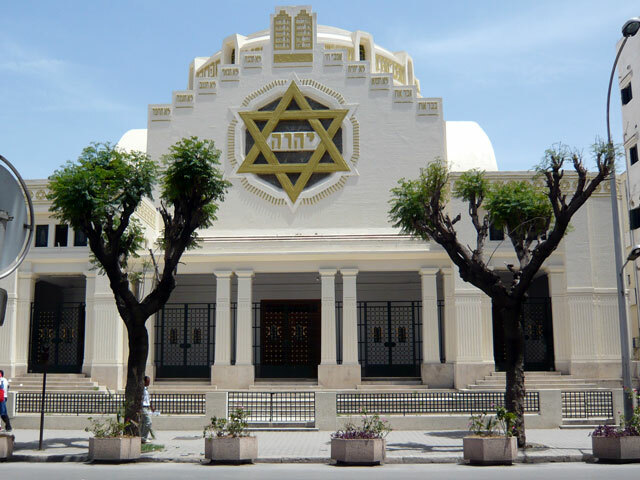 The most important item in a Jewish synagogue is the aron ha kodesh, or Holy Ark. The Ark is usually located on the wall pointing in the direction of Jerusalem, the holy city. As the name suggests, the aron ha kodesh houses the Torah scrolls. The Ark is a cabinet set into or mounted on the wall, which is then covered by a thick curtain known as a parokhet. The Ark is usually the most lavishly adorned object in the synagogue, which reflects how precious the contents are to the Jewish people. Near the Ark is the ner tamid, or eternal flame, which burns constantly and reminds the congregation of the ongoing presence of G*d in the sacred space. In Reform synagogues the bimah stands at the front, directly before the Ark and facing the congregation. A series of readings from the Torah scrolls are delivered from the bimah on Monday and Thursday mornings, as well as Saturday mornings and afternoons. Orthodox synagogues place the bimah at the very centre of the synagogue facing the Ark. A major difference between the Reform and Orthodox tradition is the gender segregation during worship. Orthodox synagogues have designated areas (mehitza) for men and women, divided by curtains or lattice, or even a balcony area. Synagogues in the Reform tradition removed the mehitza so there is no dividing barrier between men and women.